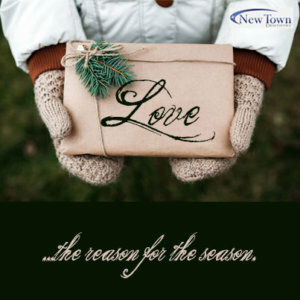 Merry Christmas and Happy Holidays from the crew at New Town Dentistry! Take a look at the beautiful array of gifts under the tree at our office! This is because our patients are so generous and supportive of our community, and of Dr. Wolfe’s initiative to help out local organizations such as Turning Point of NC. 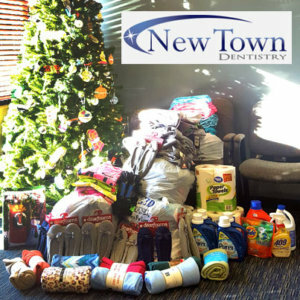 At New Town Dentistry, we are involved with our local community and global outreach operations all year round. NC Missions of Mercy and Bless Back are among the organizations Dr. Wolf supports, offering his services to our community to help people who otherwise could not afford dental treatment. At Christmastime, Dr. Wolfe and his family really get into the spirit of giving by offering our office team and patients an opportunity to join in and spread the cheer. Dr. Wolfe sets up special Christmas tree in the lobby of our office, where we collect gifts to deliver to Turning Point, a Union County safe house where people can seek assistance if they find themselves in abusive or violent domestic relationships. We believe in the work Turning Point does on a daily basis to help our entire community be a safer and happier place for everyone. Dr. Wolfe and his family will visit the Turning Point shelter facility this week to provide a meal and deliver gifts from our Angel Tree to the clients of that shelter, where families are overcoming serious situations, receiving counseling, and regaining their lives after suffering domestic abuse. Sometimes mothers and children arrive at the shelter with nothing but the clothes they are wearing. Our generous patients have helped us collect a pile of gifts and necessary items for the clients of Turning Point. Thank you so much if you participated in our Angel Tree project!